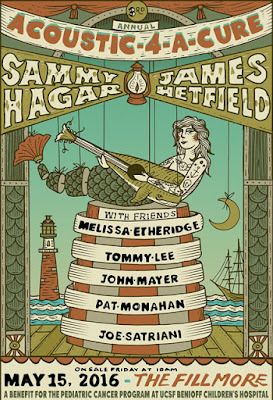 Sammy Hagar and Metallica's James Hetfield will host the third annual "Acoustic-4-A-Cure" benefit concert at The Fillmore in San Francisco on May 15. 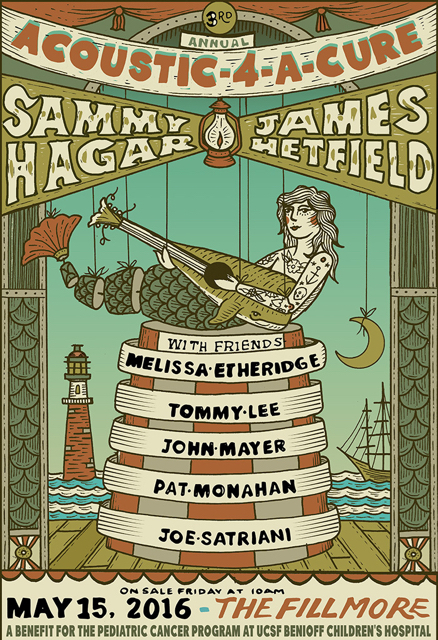 The event – which benefits the Pediatric Cancer Program at UCSF Benioff Children's Hospital – will see acoustic performances by the hosts and a lineup that includes Joe Satriani, John Mayer, Tommy Lee, Melissa Etheridge and Pat Monahan from Train, among others. Tickets will go on sale Friday, April 1 at 10:00 AM at LiveNation.com. There is a two-ticket limit per customer. The benefit lands a week after Hagar reunites with supergroup Chickenfoot to play their first full shows in four years. On August 20, the veteran metal outfit will headline the first rock concert at US Bank Stadium in Minneapolis, MN as part of its opening weekend festivities. The new home of the Minnesota Vikings will host a triple-bill with guests Avenged Sevenfold and Volbeat prior to the proper kick-off to the new NFL season.